1. Sarah Smith: born October 22, 1810 in Jefferson County, Ohio; first married April 15, 1829 in Belmont County, Ohio to William Dewees (1809-1845); second marriage June 23, 1858 in Morgan County, Ohio to Samuel Craft (1799-1881); died March 24, 1889 in Belmont County, Ohio; buried in Belmont County; known children include: James Dewees, Thomas Dewees, Smith Dewees, Caleb Dewees, Elizabeth Dewees, William Dewees, Joshua Dewees and Aaron Dewees. 2. James Smith: born April 26, 1813 in Jefferson County, Ohio; died circa 1816 in Jefferson County, Ohio. 3. Hannah Hulda Smith: born October 17, 1814 in Jefferson County, Ohio; married April 28, 1836 in Columbiana County, Ohio to Thomas Dawson Langstaff (1811-1891); died August 30, 1893 in Elsinore, California; known children include: Rhoda Langstaff, Elnthan William Langstaff, William Langstaff, Enoch Smith Langstaff, Henry Hull Langstaff, Ann S. Langstaff, Ellen Langstaff, Lindley Thomas Langstaff, Elizabeth Rachel Langstaff and Charles Langstaff. 4. Elizabeth Smith: born February 27, 1817 in Jefferson County, Ohio; married June 20, 1838 in Morgan County, Ohio to Joel Gilbert (1816-1890); died July 17, 1853 in Washington County, Ohio; known children include: Cynthia Ann Gilbert, Rebecca Gilbert, Mary Gilbert, Thomas Smith Gilbert, Sarah Gilbert, William Gilbert, Daniel W. Gilbert, Charles E. Gilbert and Eli Gilbert. 5. Evan Smith: born May 30, 1819 in Jefferson County Ohio; married November 24, 1841 in Morgan County, Ohio to Mary Burgess (1819-1906); died April 11, 1908 in Keokuk County, Iowa; known children include: Margaret Ann Smith, Maria Smith, Louisa Smith, Caroline Smith, Joshua Smith, Thomas E. Smith, Burgess Smith, William D. Smith, Sarah E. Smith, Marion Smith and Alva J. Smith. 6. Samuel Smith: born November 11, 1821 in Belmont County Ohio; married May 20 1846 in Morgan County, Ohio to Hannah King (1825-1903); known children include: Mary J. Smith, Lusinda Smith, Sarah Eliza Smith, Oliver Thomas Smith, Sarah Eliza Smith, Elizabeth Smith, Joseph Franklin Smith, Lydia Miriam Smith and Emma R. Smith. 7. Rachel Smith: born December 6, 1823 in Belmont County, Ohio; married November 22, 1849 in Athens County, Ohio to Elias Bundy (1809-); died April 9, 1886; buried in Kansas; known children include: Rachel Elizabeth Bundy. 8. James Smith: born March 16, 1826 in Belmont County, Ohio; married April 21, 1847 in Morgan County, Ohio to Ruth King (1827-); died circa 1898; known children include: William M. Smith, Caroline N. Smith and Charles Thomas Smith. 9. Margaret Smith: born March 31, 1828 in Belmont County, Ohio; died August 17 1830; buried at Somerset Monthly Meeting graveyard in Belmont County, Ohio. 10. Mary Smith: born May 15, 1830 in Belmont County, Ohio; died August 27, 1830; buried at Somerset Monthly Meeting graveyard in Belmont County, Ohio. 11. Thomas Smith: born August 9, 1832 in Belmont County, Ohio; in 1865 residing in Springville, Linn County, Iowa. 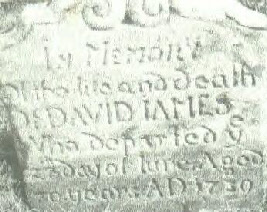 Nancy James (1792-) was the daughter of Samuel James (1754-1812) and Hannah Smith (1758-1844) of Radnor Township, Chester County, Pennsylvania. Records of the James Family Archives.